Simply Jen: My #1 Back-To-School MUST-HAVE! 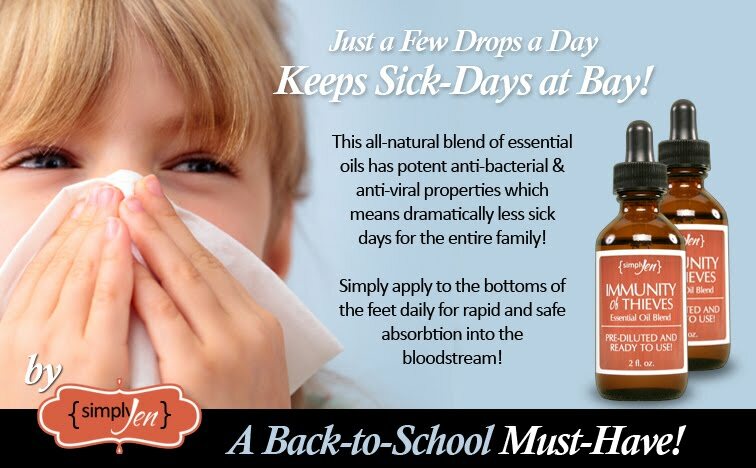 It's back-to-school time, and many parents are bracing themselves for cold and flu season. All it takes is one sick child attending school to infect an entire slew of children with a cold or the flu. And everyone knows that when a child brings a bug home from school, the entire family pays. Furthermore, days missed at school can effect funding of public schools, and missed days at work can effect family finances. My family has enjoyed many healthy days when others have been forced into bed to ride out a lengthy recovery from a cold or flu. Our secret? Essential oils! Along with all my other healthy, and toxin-free bath and body care products, I've created a special blend of 5 different essential oils called "Immunity of Thieves". The skin absorbs about 60% of what we apply to it - right into the bloodstream. With essential oils, this percentage is even greater. The molecules of essential oils are so tiny that they absorb more rapidly than substances with a larger molecular size. When applied to the body by massaging into the soles of the feet, essential oils travel through the body and affect every cell within just 20 minutes! When carefully blended together, the essential oils of Clove, Cinnamon, Lemon, Eucalyptus, and Rosemary - a synergistic effect takes place making the oils much more powerful together than they are apart. This blend of oils is highly anti-bacterial, anti-viral, and anti-fungal. When they enter the bloodstream, they have a powerful effect on our health. Essential oils have the ability to penetrate the cell wall and transport oxygen and nutrients inside the cell. This increases the amount of oxygen within the cell, which in turn gives more support to the immune system. Research has shown that people using essential oils recover 70% faster! I have personally found this to be very true! So, during the school-year, our kids know the drill. At bedtime, right before we tuck them in for the night, they each put up their little feet, and we massage about 5 drops of this pre-diluted blend into the bottom of each foot. That's it! If we ever become lax with our routine and a child starts to come down with something, we use the same method on the feet as well as on the back and chest three times a day. If we catch it quickly, the symptoms usually go right away (within a few hours). If we delay treatment, it still only takes a couple of days for perfect health to resume! And of course, this blend works just as well with adults as it does with children. Essential oils are simply amazing! I like to call them "Nature's Antibiotics" because, in my family, they have truly taken the place of prescription antibiotics - yet they are much gentler, very effective, and our bodies don't build up a resistance to them. So if I had to choose one "must-have" for back-to-school...it would most definitely be my Immunity of Thieves Oil!! Wishing you all a school-year filled with lots of learning, plenty of fun, and good health! To order your own bottle of my Immunity of Thieves Essential Oil blend, visit my online store! SJ Products Travel to COLORADO!